The iPhone and iPad make up more than two-thirds of Apple's overall sales. But the once-skyrocketing demand for both devices has begun to stall, and Apple needs to find new ways to stay on top. Apple's next chance will come September 10, when the company is all but confirmed to be launching a new iPhone. Reports are split on whether a refreshed iPad is also on tap. Apple (AAPL) is by no means in a dire situation with its mobile devices: Except for a few bumps along the way, sales for both the iPhone and iPad have mostly been rising. But Google's (GOOG) Android is growing at a much faster clip, and nothing Apple has done recently has been able to reverse the trend. Losing market share: The iPhone's share of the smartphone market peaked at nearly 24% in the holiday quarter of 2011, according to research firm Gartner. But Apple's share dropped to 21% the next holiday season, and again to 14% last quarter. Android dominates the market with a 79% share. Meanwhile, the iPad is losing its grip on the market even more quickly. Data from tech consultancy IDC shows the iPad scored more than 76% of the market when it debuted in 2010, but its share plummeted to 33% last quarter. During the same period, Android tablets nearly tripled their share from 23% to 63%. Part of the problem is that Apple hasn't launched a new smartphone or tablet in about a year, while rivals release new devices far more frequently. But there are other reasons for Apple's weakening grip on the mobile device market. An oft-cited issue: Apple has an innovation problem. "[The iPhone and iPad] were revolutionary when they first came out, but [rivals'] products that are out there now are about as close to Apple's devices as they've ever been," said Scott Kessler, equity analyst at S&P Capital IQ. "The question is whether Apple is going to introduce products that are different enough from their competitors." But Apple's problems are more entrenched than that. Apple is also struggling to entice new customers in developing markets, where its competitors are thriving. Plus, rivals like Google and Microsoft (MSFT) have been busy creating compelling link-ups between their devices and services, and those combinations are luring customers away. 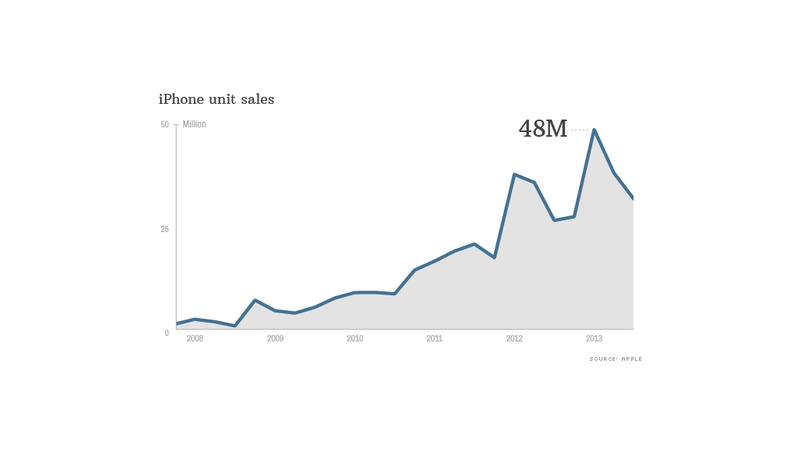 New markets for the iPhone: The smartphone market in China is simply exploding, but the iPhone ranks a sad No. 7 there, according to research firm Canalys. To gain more of a foothold in emerging markets, Apple is expected to announce the long-rumored lower-cost iPhone, dubbed the "iPhone 5C," this month. If Apple can introduce a device priced more attractively for Chinese consumers -- not to mention secure a deal with the country's largest carrier, China Mobile (CHL), which accounts for 65% of the nation's mobile subscribers -- the company could ride China's rising smartphone wave. New devices and services: On the hardware front, there's not much Apple can do to blow customers out of the water. But the company can attract new customers and keep existing users loyal by locking them in with must-have services and companion gadgets. "If most people in the world who can afford to buy an iPhone have already [done so], you have to find more opportunities in the ecosystem," said Andy Hargreaves, analyst at Pacific Crest Securities. Expanding the current roster of features like FaceTime, iMessage and AirPlay would be a smart move. Is the upcoming iTunes Radio one such feature? Possibly. Will Apple's rumored smartwatch and an "iTV" attract new customers and persuade them to buy iPhones and iPads as well? Could be. Apple's Chief Financial Officer Peter Oppenheimer said on a conference call with analysts in July that Apple will have "a very busy fall." This one is particularly crucial.